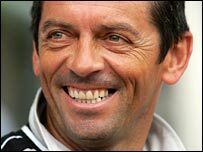 Hull City have appointed former Derby County boss Phil Brown as their new manager until the end of the season. Brown, 47, has been Hull's caretaker manager following Phil Parkinson's departure from the club last month. Colin Murphy will remain as assistant manager and the structure will be reviewed at the end of the campaign. Brown has guided Hull out of the relegation zone with home wins over Cardiff and Burnley and an away victory over Sheffield Wednesday. Parkinson was sacked after five months in charge - prompting chairman Adam Pearson to appoint Brown temporarily while recruiting a new manager. "Phil has done very well in his time," Pearson told the Hull Daily Mail. "There's no doubt about that. He's handled himself in a very professional manner. "He's certainly got the hunger and the attitude for it. It's clear that Phil's been making a real difference out on the training ground and across into games." However, Hull's improvement under Brown has persuaded the Tigers to allow the former Bolton assistant boss to remain in charge. And a club statement said: "Phil Brown will look to further strengthen his backroom staff with the appointment of an assistant coach for first team and reserve team duties. "Simon Maltby, Sean Rush and Mark Prudhoe will continue in their current football staff positions. "The club is confident that this coaching structure under the management of Phil Brown will continue to serve Hull City well and achieve the key objective of Championship survival this season."